People, we’re going to publish a book! You are here: Home / Yoga Articles / Teaching • The Business of Yoga / Yoga & Community / People, we’re going to publish a book! The Best of Yoga Lunchbox Book, coming soon! The Yoga Lunchbox is rocking. And it’s time to celebrate, in a way that serves both the YLB community, and the website itself. It’s been almost four years. Over five hundred articles. 7000 visitors a month. 1300 facebook fans. 2000 subscribers of one strip or another. And yes… now it’s time for a book! Together, we are going to publish a book, The Best of Yoga Lunchbox. Yes people, this is your opportunity to show your appreciation and gratitude for all the Yoga Lunchbox has given you over the years, and receive something tangible in return for your generousity. The Best of Yoga Lunchbox will be printed here in Wellington, and contain approximately 50 of the best articles, chosen by you – the reader, us -the writers, and me – the editor/publisher. It will give you a tangible copy of the website to store on your bookshelf, lend to friends, give to family, read in the bath, and take to the bach. There will be photos. There will be commentary. There will be reminiscing and celebration and acknowledgements. Those articles that have touched you, inspired you, motivated you, intrigued you and connected to you – they’ll all be in there, accessible at any time. There’ll also be a digital version available for those who are in love with their Kindles and iPads. Best of all, together we will have made The Yoga Lunchbox into something tangible in the world. No longer just a website, just on the internet, just online, but something that people can touch and feel and carry around with them. There’s magic in that. On Saturday August 18th, I’m going to launch a PledgeMe* campaign to raise $20,000 (and more) in 29 days. We have to raise at least $20,000 for the campaign to be successful. That’s how much I’ve calculated we need to design, produce, print, distribute and launch The Best of Yoga Lunchbox, plus give PledgeMe their cut for making this possible. 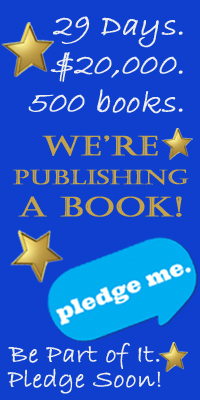 That gives us 500 copies of the book. But I have bigger plans. Much bigger. To date, I’ve built and designed The Yoga Lunchbox mostly on my own. I want to hire professional web designers and developers – like the talented people at Enspiral – to smarten up The Yoga Lunchbox, and give readers a better experience. The next $2000 raised over $20,000 will buy a revamped website. That will improve everything from the design, to the layout, to the site architecture, SEO, and the e-newsletter. That takes us to $22,000. To date, the biggest successful campaign on PledgeMe raised $21,000. At $22,000 we’ve just become the most successful campaign on PledgeMe. But there’s more. I’ve been producing The Yoga Lunchbox now for four years, on a volunteer basis. All funds I’ve raised through advertising (approximately $3000 last year) have gone back into the website, for things like hosting, admin support, software and office equipment. It’s time to change that. Any money raised over $22,000 will go toward paying me a salary of $350/wk. That means if we raise $25,500, $3,500 is ear-marked for ten weeks of salary. If we raise $40,200, that’s $18,200 over $22,000 which is enough to pay me a salary of $350/wk for the next year. Amazing what you can buy for $18,200 – me! For a year! If we raise that much money, we’ll need to do another print run of books to keep up with the rewards for the campaign. That’s $5000, taking our grand total raised to $45,200. Assuming there’s at least 1000 Loyal Lunchboxers out there, that’s about $45 each, give or take. Totally do-able. And totally exciting. Whaddya think? Up for the challenge? Here’s what I need from you right now. Get excited. Imagine holding The Best of Yoga Lunchbox in your hands. See The Best of Yoga Lunchbox on your bookshelf, beside Iyengar’s Light on Yoga or Mark Whitwell’s Yoga of Heart. Do a happy dance knowing you were a big part of making this happen. Tell us which articles rocked your world. Tell us which articles inspired you, touched you, made you cry, made you laugh. Tell us which article we have to include or else. Click here for the Best of Yoga Lunchbox survey. Think about rewards. Yes, there’s rewards. When you pledge money, you can choose a reward. We’ll be giving away things like signed copies of the book, invites to the launch party and lunch with me. But I’d also like to know, what would you want to get as a reward for supporting this campaign? Tell us in the comments below, or flick me an email. …The Best of Yoga Lunchbox. Coming to all good bookstores near you. $22,000 buys us 500 copies of The Best of Yoga Lunchbox, plus a revamped website. $45,200 buys us 500 copies of The Best of Yoga Lunchbox, plus a revamped website, a salary for me for the next year and a second print run. PledgeMe is New Zealand’s awesome crowd-funding platform. People run a campaign because they want to make something awesome happen, and they need cash to do it. Campaigns require naming how much money you need, and in how many days. Supporters pledge cash, and can chose to take rewards (we’ll be giving away everything from books to launch party invites, lunch with me, and a chance to be in the book). Campaigns have to reach their target to be awarded any money. So $19,900 won’t cut it. All the pledges made stay with the people, and we get zero dollars. $20,000 is our magic number.